The Center for Biological Diversity announced in a press release that the climate cost of the United Nations' Framework Convention on Climate Change conference, COP24, could go up to more than 4,000 metric tons of greenhouse gasses — the equivalent of flying 3000 people across the Atlantic. The food court of the 12-day event is laden with meat and fish based dishes while it only offers two vegan and three vegetarian options. 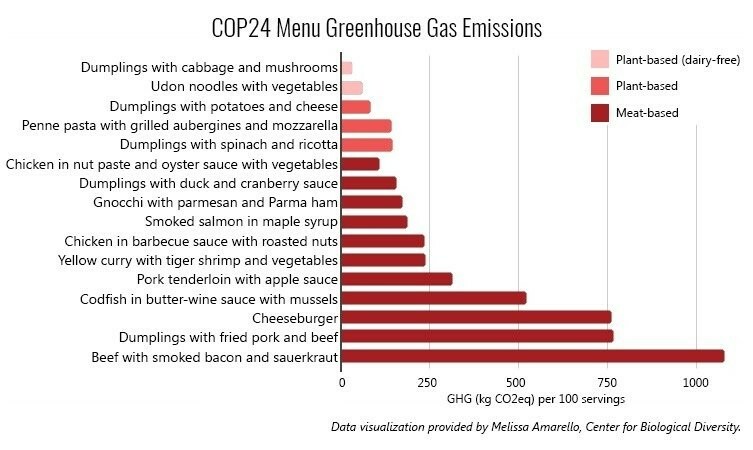 The average greenhouse gasses generated by the meat and fish based options on the menu are four times higher than the ones generated by plant-based options. If the organisers replaced the fish or shrimp with tofu, it could cut the dishes carbon footprint by 50 percent. One of the two vegan meals offered are cabbage and mushroom dumplings; this meals carbon footprint is 24 times lower than its pork and beef counterpart, also served at the food court. On top of resulting in much higher greenhouse gas emissions, the meat-based dishes require seven times more land and twice as much water compared to plant-based dishes. Stephanie Feldstein, director of the Population and Sustainability program at the Center for Biological Diversity said: "If the world leaders gathering in Poland hope to address the climate crisis, they need to tackle overconsumption of meat and dairy, starting with what's on their own plates."